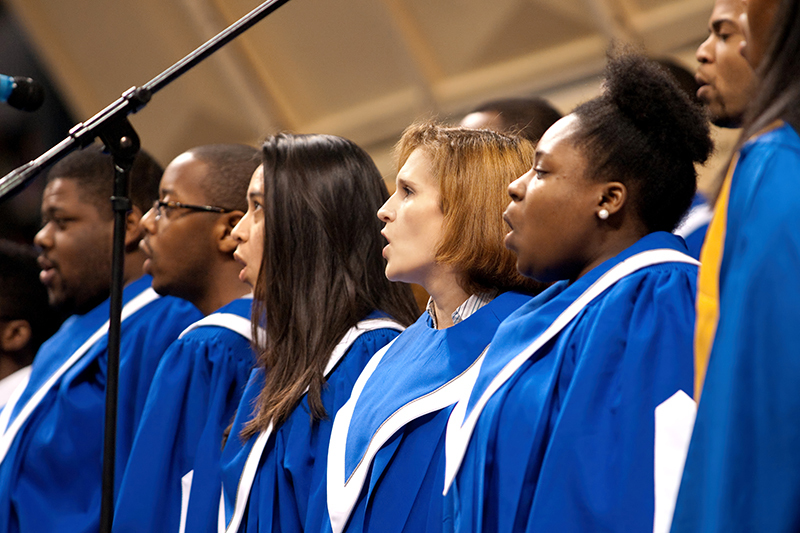 The Fayetteville State University (FSU) Concert Choir will join the North Carolina Central University (NCCU) Concert Choir for a performance of selected choruses and solos from The Messiah Part One. The Durham performance is November 30, 2018 at 7 p.m., in B.N. Duke Auditorium, and the Fayetteville performance is December 2, 2018 at 5:00 in JW Seabrook Auditorium. Tickets are $20 general admission, $10 for seniors 65 and over, $5 for college students, and free for students in grades K-12. Tickets can be purchased via Etix. Proceeds will assist both institutions with touring and recruitment. For more information, contact Dr. Denise Murchison Payton at 910-672-1457. Fayetteville State University is a constituent institution of The University of North Carolina and the second-oldest public institution of higher education in the state, having been founded in 1867. FSU offers degrees at the baccalaureate, master's, and doctoral levels. With more than 6,300 students, Fayetteville State University is among the most diverse institutions in the nation. Chancellor James A. Anderson is the 11th chief executive officer. North Carolina Central University was founded in 1909 as the National Religious Training School and Chautauqua by Dr. James Edward Shepard. It became the first public liberal arts institution for African Americans in the nation. The University is now a master's comprehensive institution that offers bachelors and master's degrees, a Juris Doctor, and a Ph.D. in Integrated Biosciences to a diverse student population.